A Department of Conservation and Recreation employee cleaned the memorial on Monday. 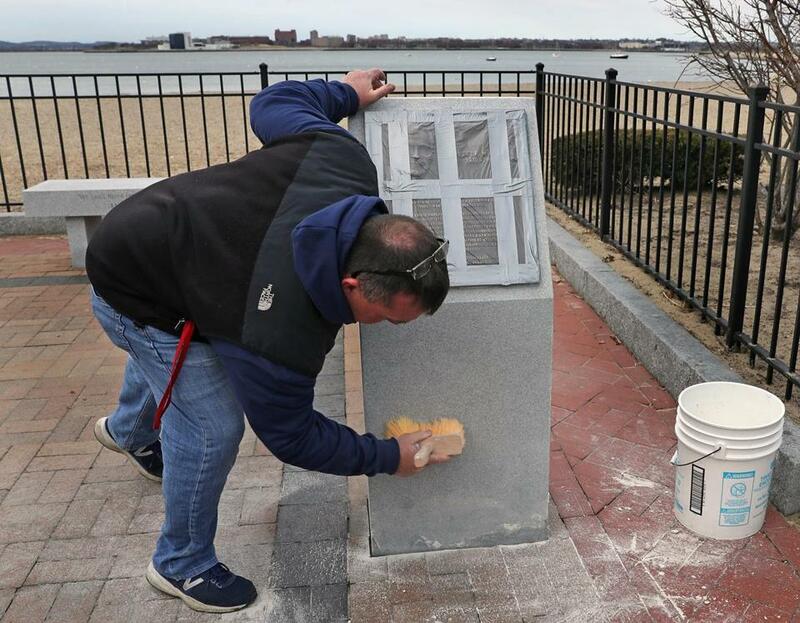 Cleanup efforts are making progress at the World War II monument in South Boston that was vandalized with oil. Ralph Morgan, an independent manufacturers representative with Prosoco Inc., a Kansas-based chemical company, tested out a combination of cleaning products on the memorial that appeared to have worked. Morgan, who specializes in cleaning masonry, said he mixed marble poultice with asphalt and tar remover liquid, and then used a trowel to put down a layer of the paste on the stained stone. After applying a layer that was about a quarter of an inch thick, it was covered with OverCoat paper, which is a kind of protective film, he said. As it dried, the poultice mixture worked its magic and wicked out the deep-seated oil stains. After 24 hours, the paper was peeled off, the poultice was scraped off, and then the stone was sprayed with water. Morgan was pleased by the results. “It looks awesome,” he said. The DCR said it was awaiting a shipment of the poultice, which is being donated by Prosoco along with services to apply it. It said the poultice cleaning process would be repeated until the substance is removed. The treatment is expected to continue potentially next week. Meanwhile, police are trying to figure out who was responsible for defacing the monument. “No one has been charged to date, but the investigation is active,” said State Police spokesman David Procopio. The vandalism at the South Boston monument may be connected to the vandalism that was recently discovered at Mount Hope Cemetery in Mattapan, where several monuments were found to be splattered with a similar kind of oily substance. 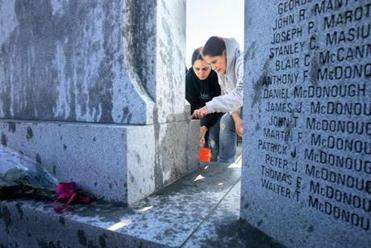 The Boston Police Department is investigating the vandalism at the cemetery, and State Police are handling the World War II memorial investigation. State Police are asking anyone with information about the World War II monument vandalism to call the South Boston barracks at 617-740-7710. Anyone with information on the cemetery vandalism is asked to contact District B-3 Detectives at 617-343-4712.